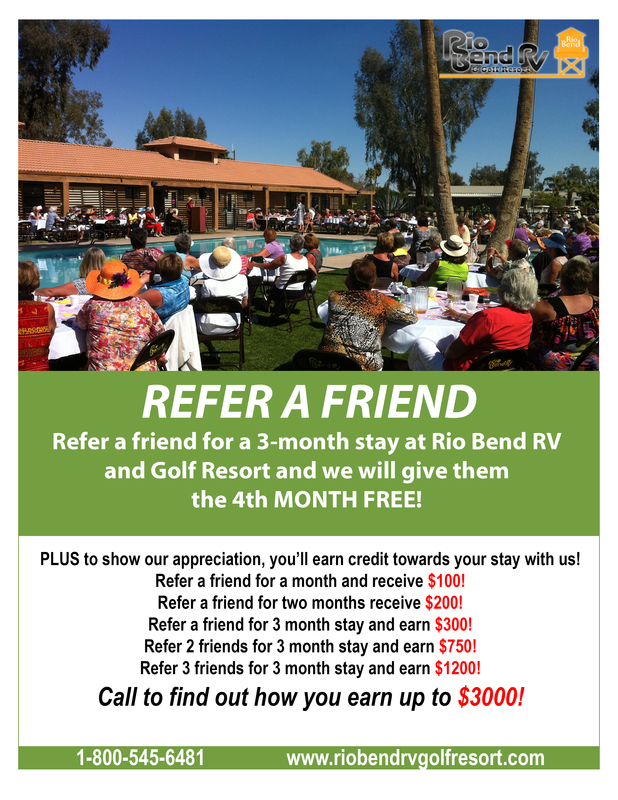 Reservations for Rio Bend RV & Golf Resort- Our community welcomes you with different rate plans making Rio Bend the ideal place to retire, vacation or make your wintertime getaway. If you like making new friends, playing, enjoying an active, interesting social life and living a healthy, stimulating lifestyle, coming home to Rio Bend RV & Golf is an inspiration. Daily and Weekly, payable in advance. Annuals payable in advance or four quarterly payments. All rates based on double occupancy. Electric not included in Monthly and Annual rates. Additional days for monthly residents are pro-rated based on season rate. Rates include WiFi. Additional guests $3.00 per person per day. We are honoring all discounts cards such as AARP, Good Sam. and AAA for daily and weekly rates only. Monthly fee of $40.00 for service and maintenance is charged to each site.